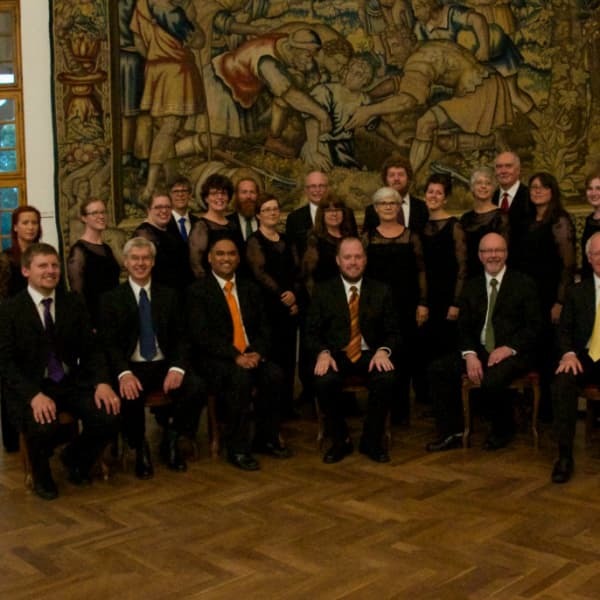 Since its inception in 1961, Da Camera Singers has established a strong presence in Alberta and holds the distinction of being Edmonton’s longest standing chamber choir. Under the artistic direction of Dr. John Brough since 2005, the choir performs a diverse repertoire that encompasses classical music from the Renaissance to the 21st century. In addition to being active with its own annual three concert season, Da Camera Singers has performed on many occasions with the Edmonton Symphony Orchestra and the Alberta Baroque Ensemble. Da Camera first appeared with the ESO in 1971 in a concert and subsequent live recording with British band Procol Harum. A reunion concert was performed in 2010. Da Camera has been broadcasted nationally on CBC, and has toured through Canada, the United States, and parts of Europe. In the summer of 2015, they completed two week tour through parts of Austria, Hungary, and Slovakia, which included a concert in St. Stephen’s Cathedral, Vienna. Among their recordings is the only commercially available recording of renowned Canadian composer (and former ESO Composer in Residence) John Estacio’s Eulogies (2009). In 2013, Da Camera released a collection of 20th and 21st century Christmas carol arrangements entitled Kings and Shepherds featuring the music of Jonathan Dove, Ola Gjeilo, and Jake Runestad. Da Camera is happy to be returning to the Winspear stage with their friends in Chronos Vocal Ensemble for this year’s ESO Messiah.